THREE sides remain undefeated in the South Australian National Football League (SANFL) Women’s League after two rounds, following West Adelaide and Glenelg triumphing over the newcomers for the second consecutive week. 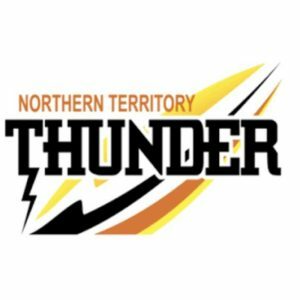 Norwood got the job done against the reigning premiers in a grand final rematch, while North Adelaide recorded its first win of the season, finishing strong against Sturt. North: Kelly Barltrop 5, Nadia Von Bertouch. 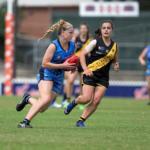 Sturt: Nicole Baker, Lucy Griffith, Lauren Lovell, Jess Schulz, Caitlyn Swanson. A five-goal haul to Kelly Bartrop has handed North Adelaide its first win of the season, defeating Sturt by seven points on Friday. Barltrop’s handful came in two spurts, as she nailed the first two goals of the game, and then another three consecutive goals over the second and third quarters to take control of the match for the Roosters. The Double Blues still managed to lead at the main break despite her early heroics, as Jess Schulz, Lauren Lovell, Caitlyn Swanson and Nicole Baker all converted opportunities in the first half for Sturt to lead by five points at half-time. With Barltrop taking control in the second half, a late goal to captain, Nadia Von Bertouch gave the Roosters a 15-point lead. Lucy Griffith quickly cut the deficit to nine points in the sixth minute of the final term, before misses to Schulz and Georgia Swan proved costly, as Sturt fell short of a comeback. Sturt dominated the disposal count (218-180), disposal efficiency (65 per cent to 58 per cent), marks (33 to 22), and even won the inside-50 count, but the tackling pressure of the Roosters (71-51) meant the defensive pressure was ever-present. Barltrop’s five goals game from just six kicks in an ultra-efficient effort, while Von Bertouch booted 1.2 from 20 disposals – 19 kicks – four marks, six inside 50s and two tackles. Paige Allen finished with the 16 touches, three marks and four inside 50s, while Leah Tynan (12 tackles) and Rheanne Lugg (nine) brought the heat. Georgia Bevan was superb again for the Double Blues, racking up 24 disposals, one mark, three inside 50s, two rebounds and laying four tackles, while Maya Rigter had a team-high seven tackles to go with her 16 disposals and four inside 50s. Larissa Schenscher was another who stood tall in the back half, taking five marks from 14 touches and had two rebounds. Next week both sides face unbeaten teams, with the Roosters coming up against Glenelg, while Sturt travels to Coopers Stadium to face the Redlegs. West: Chelsea Biddell 6, Emma Smith. Eagles: Sarah Perkins 3, Jaimi Tabb 2, Kiana Lee. A stunning last quarter comeback by new side, Woodville-West Torrens has fallen agonisingly short, going down by three points to a Chelsea Biddell-inspired West Adelaide team. The Eagles actually led at quarter time courtesy of three behinds, before the Biddell took control of the match inside 50, converting three goals. With young star, Kiana Lee adding one for the visitors, the Eagles trailed by 12 points at the main break. Despite Adelaide AFL Women’s star Sarah Perkins converting her first in the third term, another three majors to Biddell, and one to Emma Smith saw the Westies lead by what looked to be an unassailable 28-point lead. Enter Perkins and Jaimi Tabb. Perkins took just 50 seconds in the final quarter to convert her first, while Tabb booted back-to-back goals in the first 10 minutes. When Perkins missed a chance late in the game, she quickly put another major on the board, but it would prove too little, too late in the end for the brave Eagles, as they held the Bloods scoreless in the last, only to lose by three points. Woodville-West Torrens dominated disposal (201-153) and won the inside-50 count (26-20), but could not stop the Bloods rebounding it out of the back 50 (20-13). Both sides had elite disposal efficiency with the Eagles nudging out the Bloods 77-74 per cent for the game. Along with her six goals, Biddell had 11 touches, four marks and five inside 50s, while a number of younger stars also stood up. Abbie Ballard had 16 disposals, three marks, four tackles and two inside 50s, while six of the Bloods’ rebounds came from the boot of Madison Newman, who also recorded 18 disposals and two marks. Leah Swain was again prominent in the ruck with 23 hitouts, the former basketballer too tall for her opponents. For the Eagles, Stephanie Walker was terrific with 24 disposals, two marks and three rebounds, while Tabb laid eight tackles to pair with her two goals and 18 touches in a strong all-round game. Georgia Taylor was again prominent in defence with three rebounds from 13 disposals, while Natasha Farrier laid six tackles, and Perkins took two contested marks from 11 disposals and three inside 50s. Next week, the Eagles face fellow newcomers, Central District in a bid to secure their first-ever win in the SANFL Women’s competition, while West Adelaide comes up against a South Adelaide side undoubtedly fired up after a loss to Norwood on Friday. Glenelg: Ellen Fauser, Olivia Walker-Obushak, Rebecca Steer, Hannah Crump, Samantha Franson. Central: Katelyn Rosenzweig 2, Isabella Wilson. Glenelg’s promising start to the season continued on the weekend with a second win over another new side to the competition, defeating Central District by 17 points. From when the Tigers hit the front through a first quarter Ellen Fauser goal, they never relinquished it, as Central drew level early in the second term through Isabella Wilson, but a couple of late majors to Glenelg saw them skip to a 14-point half-time lead. A dour third term saw Hannah Crump add the only major of the quarter, as Rebecca Steer and Caitlin Gould missed opportunities, but more importantly for the home side, their opposition could not seem to find an avenue to goal. It took until the eighth minute mark of the final term for Adelaide AFL Women’s forward, Katelyn Rosenzweig to find the big sticks, then backed it up five minutes later to cut the deficit to 11 points and give Central District a sniff. Samantha Franson put the result beyond doubt in the dying minutes of the final term, giving the Tigers a 17-point buffer, which was the final margin. Glenelg earned its victory with a whopping differential in disposals (215-151), disposal efficiency (67-51 per cent), marks (40-13), hitouts (35-14) and inside 50s (34-12). Many might wonder how the Bulldogs managed to get so close considering the statistics, but a league season-high 93 tackles just applied pressure around the ground and made the Tigers earn every possession. They also won the rebounds 26 to nine, and with tidying up their skills and getting more opportunities going forward, the Bulldogs could certainly be a highly effective side. 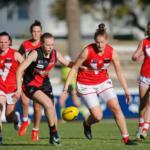 For Glenelg, Cassie Hartley and Ellie Kellock led the way in disposals with 18 each, as they combined for eight marks and seven tackles, while Kellock had three of her side’s nine rebounds. As well as her goal, Fauser recorded 16 touches, six marks (one contested), three tackles and four inside 50s, while Gould was prolific around the ground in the ruck, totalling 16 hitouts and six inside 50s from 14 disposals. For Central District, Danielle Stewart had a game-high 19 disposals, as well as laying five tackles, while Shannen Solly racked up seven rebounds from 14 disposals. Setting the tone for tackles was Caitlen Teague (12), while Madison Lane (10), Shailee O’Brien (nine) and Isabella Wilson (nine) were also strong on the inside. Next week the Bulldogs will hope to get one-up on fellow new side, Woodville-West Torrens, while Glenelg aims to continue its unbeaten streak against North Adelaide. Norwood: Najwah Allen 2, Hannah Dunn, Monique Hollick, Bree-Anna Liebhardt. South: Lauren Buchanan, Jessica Kirk, Indy Tahau. Four of the game’s five goals in the middle two quarters proved to be the catalyst for Norwood in its win over reigning premiers South Adelaide on Friday night. In what shaped to be a terrific grand final rematch, Lauren Buchanan became the early hero for the Panthers with the only goal of the first term. Ball magnet, Hannah Dunn squared the ledger by half-time as both teams headed into the rooms at 1.2 apiece. The third term got off to the best start for Jessica Kirk‘s Panthers as her goal saw them break the deadlock, however three consecutive goals – two to last week’s hero Najwah Allen – resulted in the Redlegs heading into the final break with an 11-point lead. South’s Indy Tahau cut the margin to less than a kick eight minutes into the final term, but a late goal to Bree-Anna Liebhardt gave the Redlegs some breathing space, and proved to be enough in the end with a 12-point win. Both teams found plenty of the ball, with Norwood’s kick-first mentality proving the bigger asset over the Panthers balanced approach between quick hands and possession football. They were evenly matched for the most part, with Norwood edging ahead in the inside-50 count, 34-28. Allen was terrific once again, having a game-high 24 disposals, four marks, six tackles and four inside 50s to go with her two majors, while last week’s round disposal leader, Hannah Dunn had a solid 17 touches, five tackles, two inside 50s and two rebounds. Monique Hollick did some great work going forward with five inside 50s from 15 touches and an all-important third quarter goal, while Sophie Armitstead laid seven tackles from 12 disposals and four inside 50s. For the Panthers, Czenya Cavouras had a team-high 19 touches, seven tackles, three inside 50s and three rebounds, while teenage AFL Women’s Academy member, Montana McKinnon was superb in the ruck and around the ground, racking up 18 disposals, 11 hitouts, three inside 50s, two rebounds and laying two tackles. Samantha Pratt (18 touches, four rebounds and three tackles), Cheyenne Hammond (15 disposals and five rebounds), Jaslynne Smith (15 disposals and three rebounds) and Hannah Munyard (14 disposals and three inside 50s) were others who stood tall for the losing side. Next week, Norwood will be keen to make it three wins in a row when it faces the winless Sturt, while South Adelaide will be keen to bounce back against the undefeated North Adelaide.